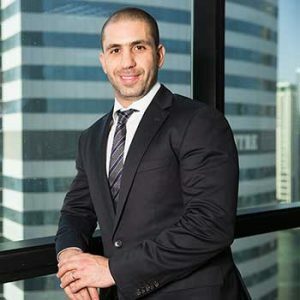 Ziad Kamel is a co-founder and Managing Partner at Aegis Hospitality, an F&B Management Company in Dubai. He is also a co-founder of The Alleyway Group in Lebanon and served as its CEO for 11 years, creating and managing over 8 concepts including Couqley, a renowned French bistro. Ziad has a BA in Business Administration from the American University of Beirut and a Master’s of Science in Marketing Management from the University of Surrey in the UK. He is the elected Secretary General and member of the board of directors of the Syndicate of Owners of Restaurants, Cafes, Nightclubs and Patisseries in Lebanon for the 2014-2018 term. He has worked for 5 years as a Communication Supervisor at Leo Burnett Beirut leading the communications for an established bank and an international telecom company between 2003-2008. Based in Dubai with his family with frequent visits to Beirut, Ziad is dedicated to the development, management and growth of his F&B portfolio. With his partner at Aegis Hospitality, Stereo Arcade was launched at the DoubleTree by Hilton on JBR in 2015, a unique concept consisting of 2 nightlife venues and a video arcade under one roof; a retro nightclub and a live rock. He is the Managing Director of Couqley, a French Bistro with two branches in Lebanon and one In Dubai, with several additional branches planned for both countries.